A chart from BGR's latest report shows how New Orleans hotel taxes are distributed. 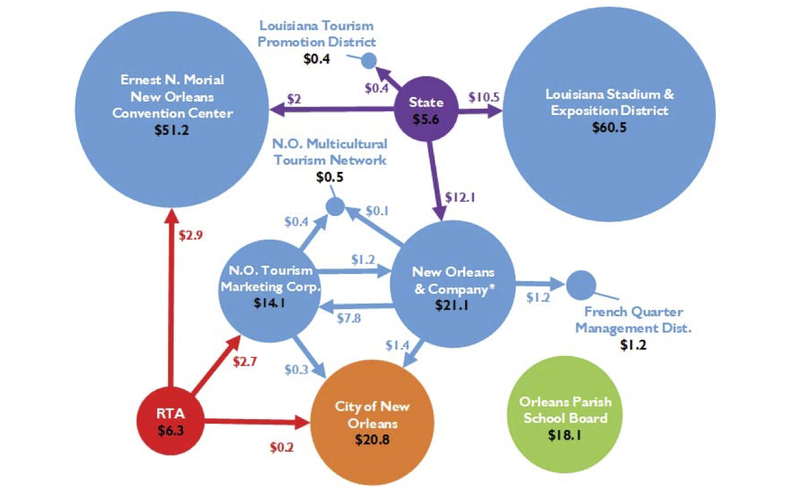 A chart from BGR\’s latest report shows how New Orleans hotel taxes are distributed. A new report from the Bureau of Governmental Research released on Wednesday found a lack of accountability and transparency when it comes to New Orleans hotel tax revenue, and recommended that the city get at least $12 million more per year, either by raising hotel taxes or reallocating hotel taxes that are now being used to boost tourism. The 16.35 percent in nightly hotel taxes applied to hotel guest bills in Orleans Parish brings in an enormous amount of cash each year — $200 million, or roughly one-sixth of all local tax revenue in Orleans Parish. But only $20.8 million of that is allocated to the city government, the report said. And about ten percent of that has to be spent on tourism, leaving just $18.9 million for general municipal services. The bulk of the hotel tax revenue — $150.9 million — is allocated to four tourism industry organizations: the Louisiana Stadium and Exposition District, the New Orleans Ernest N. Morial Convention Center, New Orleans and Company (formerly the New Orleans Convention and Visitors Bureau), and the New Orleans Tourism Marketing Corporation. The share of New Orleans hotel tax revenue going to tourism — 75.5 percent — was larger than 12 peer cities across the country. By comparison, only 30 percent of Atlanta’s hotel taxes are fed back into tourism, according to the report. Seattle was the second-highest, with 72 percent. The Convention Center has used this annual funding to accumulate $235 million in unrestricted reserves, nearly quadruple its reserve fund in 2002, according to the report. Much of this growth is due to a one percent hotel tax and a .25 percent citywide food and beverage tax passed by the state Legislature in 2002 to fund an expansion of the center. But the Convention Center ditched that plan after Hurricane Katrina, and the expansion never happened. This new report is the latest in a string of BGR publications fueling a statewide debate over hotel tax dedications and the Convention Center’s $557 million capital plan, which includes center renovations and a publicly subsidized hotel. An initial proposal for the hotel said it would be financed in part by a $41 million contribution from the Convention Center, 40 years of hotel and sales tax rebates, a 100% property tax exemption, and a free land lease. A BGR report from July found that the the various public contributions for the project would add up to $738.8 million over 40 years, or $329.5 million in today’s dollars. “The proposed deal would involve, by far, the largest public contribution to an economic development project involving a private entity in recent memory in New Orleans,” that report said. A month later, Mayor Latoya Cantrell penned a letter stating her “strong opposition” to the public subsidies going to the hotel project. Since then, she’s broadened her critique, taking aim at how hotel tax revenue is allocated in the first place and insisting that more of it should be in the hands of the city government to provide general municipal services. But that’s largely out of her control. Most of the changes she’s pushing for have to be made by the state legislature. And in November, Governor John Bel Edwards and state Senate President John Alario both came out against Cantrell’s ideas. A spokeswoman for Edwards said the governor’s office will take a look at the recommendations and discuss them with Cantrell’s office, the convention center board and state legislators. She declined to comment further on the report or its recommendations. But she hasn’t yet backed down from the idea. In a written statement, New Orleans and Company President Stephen Perry stood by the plan as a workable solution for the city’s infrastructure needs. Perry, however, said an increase of one cent on every hotel dollar — the minimum the BGR report calls for — would be too much. “The state of Louisiana and our New Orleans hospitality industry have partnered for decades to build, renovate, operate and manage the two largest economic drivers in New Orleans,” the Superdome and the convention center, Perry’s statement said. The “hotel tax” analyzed in the report is actually a collection of 16 distinct taxes that hotel guests in Orleans Parish must pay, according to the report. The first of these was created in 1966 — a 4 percent hotel tax dedicated to the newly created Louisiana Stadium and Exposition District to finance the construction of the Superdome. To ease the burden of the new tax, the city suspended the then-1 percent sales tax for hotels. Both the 4 percent tax and the suspension of the one percent sales tax are still in place today. That means that hotel guests are only paying 1.5 percent of the city’s current 2.5 percent sales tax rate. “This ‘lost penny’ of hotel tax will deprive the City of an estimated $12.3 million in 2019,” it says. The four percent tax is set to expire when the stadium district retires its debts. At that point, the “lost penny” sales tax would be restored as well. But according to the report, the district has been able to keep the tax in place by issuing new bonds or refinancing its debt. The stadium district is also required by state law to share a portion of its end-of-year surplus with various entities in Orleans and Jefferson Parish, including the New Orleans Recreation Development Commission and various university programs, according to the report. But the district hasn’t shared any of its surplus since 2001. According to the report, the stadium district changed its legal interpretation of the law in 2002, arguing that it cannot have a surplus as long as it has outstanding debt. Now, the district puts the surplus funds into a capital fund instead. “The district’s interpretation renders the surplus-sharing statute ineffectual,” the report says, noting that the district had a $7.5 million surplus in the 2017-2018 fiscal year. But the issue of strategically sustained debt isn’t confined to the stadium district. The Convention Center directly receives 3.7 percent of the hotel tax. Just like the Superdome tax, that 3.7 percent is set to expire when Convention Center retires all related bonds. But the center has been able to keep the taxes in place with new and refinanced bonds. The report didn’t just take aim at the allocation of hotel taxes, it criticized their lack of accountability and transparency. “There are a total of 16 hotel tax levies that are divided and, in some cases, subdivided into 29 revenue shares that go to a dozen different public and private entities and purposes,” it said, going on to note that there are 15 separate acts governing the Convention Center’s use of hotel tax revenue, and that they haven’t been codified into a single document. It ultimately argues that this “the complex web of laws and revenue sharing agreements” makes it harder for citizens to understand where the money is going and for what purposes. In addition, the report says that there is a lack of accountability for this tax structure since all but one of the hotel taxes are either permanent or indefinite. This precludes a periodic reassessment of whether the hotel taxes are still appropriate for current tourism needs, it argues. The report ultimately recommends that the legislature should set sunset provisions on the hotel taxes and review all existing dedications to make sure they’re still appropriate when measured against competing municipal needs like water management and public safety. The other major recommendation is that at least one additional percent of hotel tax revenue should go to the city for general municipal services. Much of that power lies in the state legislature, but the report suggests that there might be a way for the city to act unilaterally. The report suggests increasing a flat, nightly hotel fee — created in city law and used to fund the New Orleans Tourism Marketing Corp. — by an amount equivalent to a half-percent tax. That would would bring total hotel taxes up to about 16.9 percent. The report says the higher rate would be unlikely to have a negative impact on tourism because 16.9 percent was the effective hotel tax rate from 2016 to 2018, due to a one-penny sales tax increase in effect at the time. Tourism industry reports show that even with that tax increase — reduced to a half-penny last year — tourism numbers and spending in the city continued to rise during that period, according to tourism industry economic impact reports. This story was updated after publication with comments from Gov. John Bel Edwards’ office and New Orleans and Company President Stephen Perry.